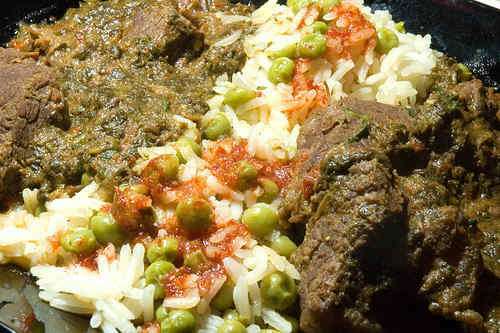 A mild Indian-style curry of lamb. With a pressure cooker, total preparation time is a bit more than an hour. See notes for non-pressure-cooker instructions. Set pressure cooker over medium-high heat. Add butter and onions. Cook until onions are nicely browned. Add coriander, cumin, ginger, turmeric and garam masala. Cook for another minute or two until fragrant. Add garlic and bell peppers. Cook until bell peppers start to soften. Add meat. Cook until browned and fragrant, 5-10 minutes. Add cayenne pepper, salt and spinach. Add white wine and stock. Put on lid and cook at high pressure for 30-35 minutes. Reduce heat if necessary. Release pressure. Reduce over medium heat until most of the liquid has evaporated. Stir in mint, lemon balm and cilantro. Stir in yogurt or kefir. Without a pressure cooker, step 6 changes as follows: Cover and simmer over low heat until meat is tender, ca. 1 - 1½ hours. Add water if necessary. If you have leftovers, no problem. This dish keeps a day or two in the fridge and freezes very well, too. After re-heating you'll probably need to adjust the seasoning. This recipe is the result of "reverse-engineering" a similar dish at one of our favorite local Indian restaurants.